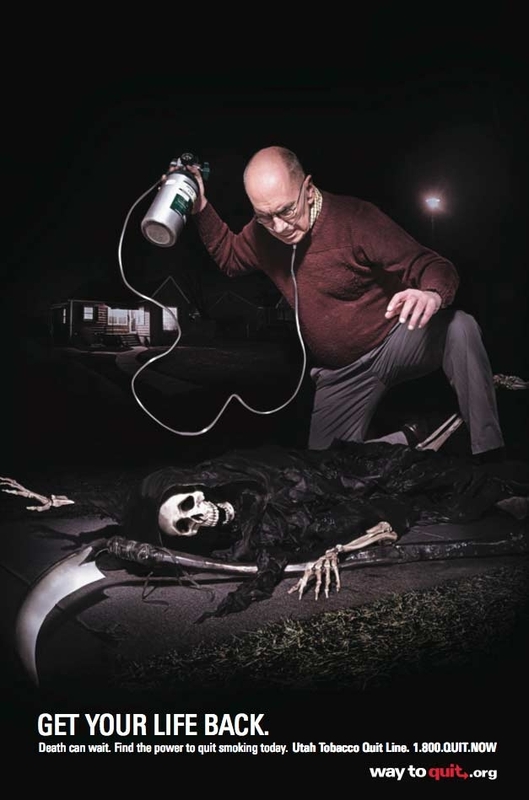 A print campaign for the Utah Department of Health's Anti-Tobacco initiative shows former smokers turning the tables on the grim reaper. 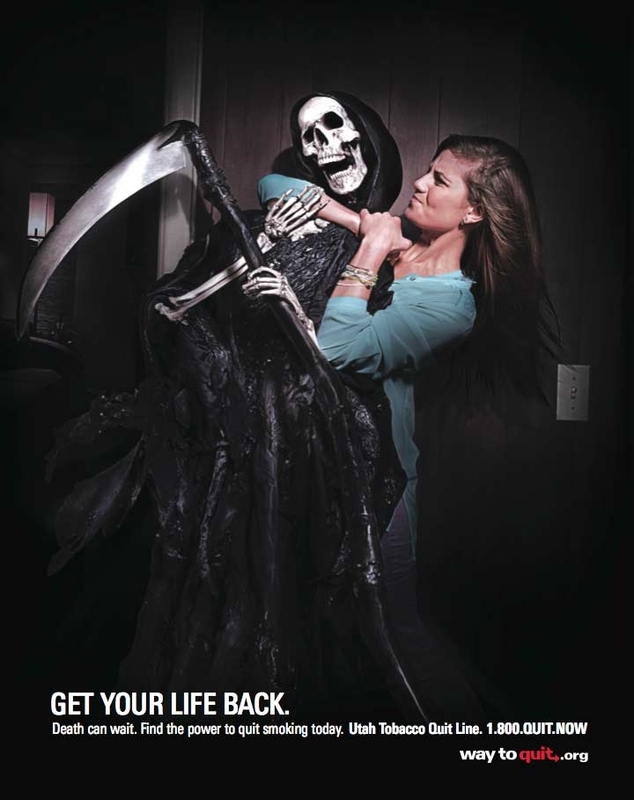 Each ad shows a former smoker, even one with an oxygen tank, placing the grim reaper in various defensive take-down poses, like a chokehold. 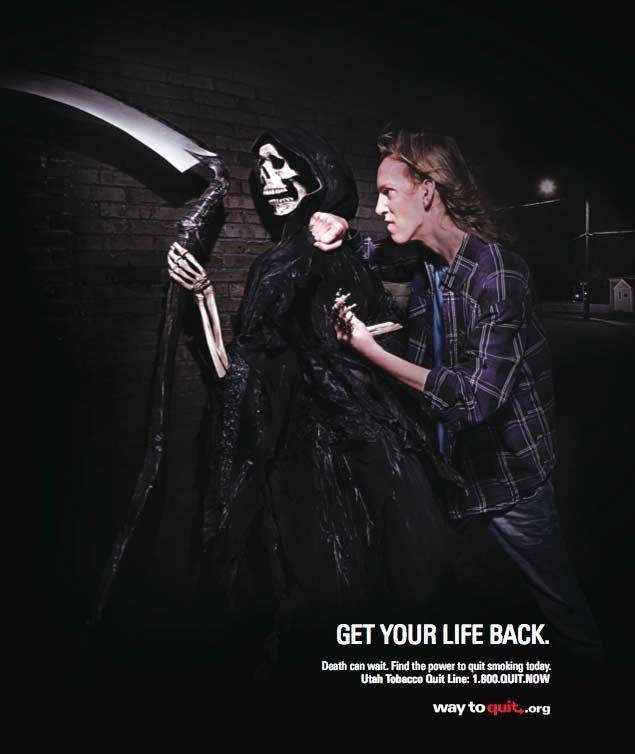 Each ad reads: "Get your life back. Death can wait. Find the power to quit smoking today." See the ads here, here and here, created by R&R Partners. Mike's Hard Lemonade launched an animated TV spot that tells the story of the brand's inception. It was founded back in 1999, so I feel old at the start. The company came to life in Mike's garage and took the beer category by storm. The company prides itself on only using natural ingredients and creating new recipes from scratch -- most likely not in the garage anymore. The spot serves as a precursor to an upcoming summer campaign. Watch it here, created by TRISECT and produced by Sarofsky Corp.
Blake Griffin believes he can fly... in a Kia Optima. The NBA star is passionate off the basketball court, playing an overzealous action hero in an upcoming blockbuster movie. Rather than fly in a jet, Griffin prefers to fly in his Kia Optima, causing the director's ulcer to flare. With help from special effects, Griffin ends up flying in his car, hopefully taking the enemy by surprise. Watch it here, created by David&Goliath. Russian clown Oleg Popov, also known as "the Sunshine Clown," is the perfect example of someone who made his work his play and his play his work. McDonald's celebrates its 60th anniversary in Germany with a 1:30 ad that pays tribute to Popov, who still performs at the young age of 84. Wieden+Kennedy Amsterdam launched a 30-second black-and-white ad starring NBA star Blake Griffin. Running in Italy and France, the spot promotes the latest Jordan brand collection available at Foot Locker stores throughout Europe. Griffin rises above any negative comments from those who doubt his talents, closing the ad with a slam-dunk. See it here. What would Jesus do in a marketing meeting? McDonald's celebrates 60 years in Germany. Let's launch! NEW! What Would You Do For a Bowl Of KRAFT Mac & Cheese? KRAFT Mac & Cheese launched a trio of ads for its ongoing "You Know You Love it" campaign. "Young at Heart" stars the adorable Estelle Harris as a grandmother who chooses to sit at the kids' table so she can eat macaroni and cheese.